In 1935 the Austrian Boehler company developed a lightweight antitank gun called the M 35, which was a 47mm weapon that was small and light enough to break into five separate loads for use with pack animals. It proved popular with the untried antitank forces of the day and was widely sold and produced under license in many countries. The Italians were one of the licensees and produced a shorter version of the gun as the Cannone da 47/32 M 35. A later model, the M 39, used a slightly different design of carriage and was some 130 pounds lighter (611lbs vs. 740 lbs). It was slightly more powerful than the German PaK 36/37 3.7 cm gun but inferior to the Czech 47mm or the Soviet 45mm guns. But it saw wide use with the Italian army, as it was light and could throw a 3 pound high-explosive projectile for infantry support. 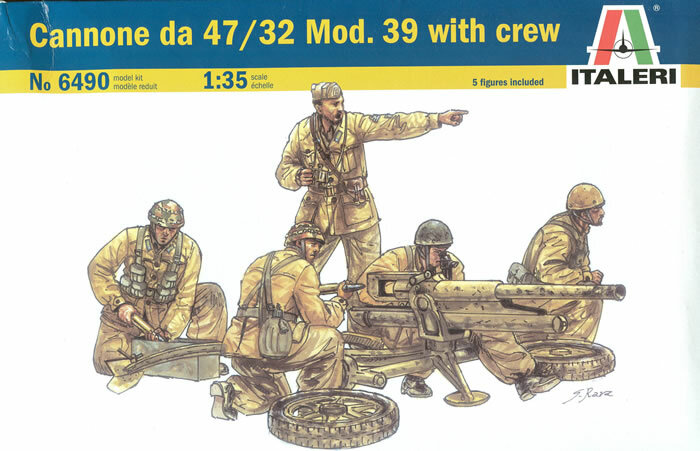 This nice new kit from Italeri presents the later Model 39 version with lightweight wheels (albeit the original wheels are shown on the box art, that is not what comes in the kit) and a crew of five in the long desert uniform. The gun itself consists of 52 parts and includes all of the necessary bits as well as six rounds and a case for the ammunition. Even though it is a tiny gun it comes with a three-piece barrel, separate recoil mechanism and breech block, and will permit free elevation and traverse if properly assembled. Optional seats (I guess they are seats, but are like the gun very tiny) are included for the crew members. A pedestal mount is included for use in other kits (a kit of the Semovente 47/32 is also coming). But the only option shown in the kit has the gun with trails and spade deployed for combat with the wheels removed to lower the silhouette. There is a sprung axle mount (part 33F) which comes with the wheel mounts in place (one was broken off the review sample in shipping) but no word on what they are for, and all it says is to cut them off. Stub axles Parts 36F are then glued to the wheels for display in the removed position. Also a locking brace (39F) is shown installed but it would fold back for movement; likewise two lifting handles (40F-41F) are shown stowed. It’s too bad the kit engineers allowed for this but the direction writers did not. The crew figures are somewhat simpler than other conventional figures – the heads come molded onto the torsos as do some of the equipment. While they are thus somewhat old-fashioned in design, the figures show better animation and details than many older Italeri figures. Three of the personnel (the gun commander and two of the crew) sport beards and mustaches and all have reasonably good expressions. They appear to be wearing Italian airborne helmets from what I can determine with the officer in a “tent hat”. The four crew figures cover the gunner, loader and two “other numbers” with extra rounds. The seams and some of the details on the figures are a bit deeper or smoother than many today prefer, but from what I gather most modelers are happy to compensate for a lack of separation for an easier-to-assemble and paint figure. Artwork is by a G. Rava and is in watercolor; while very artistic it unfortunately gives the impression these troops are wearing desert “tiger stripes” which they are not. Painting directions are of the “follow the chart on the back of the box and the box art” type. Overall the kit is a bit pricey but lately Italeri has been once more providing details as they did when they started over 35 years ago. The gun is a gem and the crew are nicely posed to suit the piece. I do wish they had covered the other assembly options in the directions though.